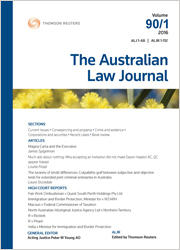 This article considers the application of PW Young, “Fact finding made easy” (2006) 80 ALJ 454 to the unique challenges faced by decision-makers and advocates in refugee status determination (RSD) in Australia, drawing upon the author’s experiences in refugee law and advocacy. Unlike most other forms of proceedings, RSD offers little scope for corroboration of individual claims for asylum, requiring greater consideration of the inherent plausibility of claims and the manner in which such claims are presented than of whether external sources can verify particular claimed incidents. The utility of Young’s observations in this context is assessed and the need for caution in applying principles of fact-finding drawn from other jurisdictions to the particular context of RSD is emphasised. Criminal property confiscation legislation is widely regarded as an important weapon in Australia’s arsenal against serious and organised crime. The statutory regimes provide for a wide range of confiscations, including the confiscation of literary proceeds – the benefits received from the commercial exploitation of one’s notoriety from having committed a crime. This article commences with an examination of the operation of literary proceeds confiscation in Australia by reference to the Commonwealth legislation. It goes on to consider, and suggest an explanation for, the seemingly selective application of the legislation in a series of high profile cases. This article reports the findings of the first study in Australia to compare the responses of judges and jurors in 122 real cases who were asked to identify the appropriate relevance and weight that should be given to some of the most commonly listed aggravating and mitigating factors in sentencing. The research reveals that, while jurors and judges in Victoria are alike in giving more weight to aggravating factors than mitigating factors and in supporting an individualised approach to sentencing, jurors give less weight than judges to some mitigating factors, including good character, being a first offender, youth, old age and physical illness. Jurors also adopted broader interpretations of aggravating factors like breach of trust and the relevance of prior convictions. They also preferred a different rationale for discounting sentences due to family hardship. For the PDF version of the table of contents, click here: ALJ Vol 92 No 5 Contents.